A woman in western P.E.I. says she’s facing financial ruin as a result of renting out her house. 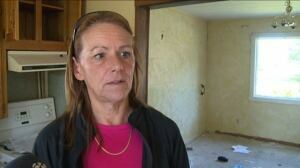 O’Leary resident Lee Cowan told CBC News tenants trashed her three-bedroom home then moved out last month without telling her. She said the basement of the house was flooded, drywall is torn off walls, and cabinets and appliances are ruined. The damage has been reported to police. Cowan said insurance won’t cover all the damage, but since posting photos on Facebook she has been overwhelmed by support. Insurance adjustors are still tallying the cost of repairing damage to the home. Cowan is looking for legal advice on what to do next. The Atlantic region needs to attract more companies to fill empty office space as landlords battle for the same number of tenants, delegates at a real estate conference heard Tuesday. Todd Bechard, Atlantic region executive vice-president for Cominar REIT, said during a panel discussion at the Atlantic Real Estate Forum in Halifax that more work needs to be done to attract new tenants to the region. The competition for new tenants is particularly fierce in Halifax, as suburban landlords vie to fill new space in sprawling new developments, while downtown owners are looking to keep pace. According to a recent CBRE Ltd. report, overall vacancy in Halifax was 9.7 per cent in the first quarter. The downtown rate fell to 10.3 per cent, while the suburban rate rose to 9.2 per cent from the previous quarter. A humorous exchange between Barry Stockall of Crombie REIT and William Hardman of Hardman Group highlighted how competitive the office market is in Halifax. Speaking about tenants’ desire for amenities such security and parking space, Stockall, senior director of office leasing at Crombie, noted how much work is being done to compete with the suburban market. “The more you give them, the easier it gets to lease the space. The lobbies, the buildings, are being constantly upgraded to try to compete with Bill and his new buildings now in Burnside (Park). You’ve got to be pretty sharp,” Stockall said, referring to the new $50-million business campus at the corner of Wright Avenue and Burnside Drive that Hardman Group is developing. “We haven’t stolen any of your (tenants) yet,” Hardman said. “And you’re not going to, either,” Stockall replied, eliciting laughs from the room. Halifax Developments Ltd., owned and managed by Sobey family-controlled Crombie REIT, is planning to build a three-storey addition to Scotia Square between Barrington Tower and the Delta Halifax. Earlier this year, the company also received approval to build another three-storey, 100,000-square-foot addition of class A office space dubbed Westhill on Duke at the corner of Duke and Albemarle streets. Hardman said tenants’ preference to relocate to the suburbs stem from their need for buildings that offer new amenities that also promise lower operating costs, something that has been lacking downtown until recently. “We look at it and say that it’s really an evolution of choices for tenants,” he said. But Hardman said with work underway on the Nova Centre, the TD Centre expansion and the RBC Waterside Centre, downtown Halifax is on the verge of a comeback, creating a more balanced environment. TRURO – The Town of Truro has officially been named one of the few places in Nova Scotia to become involved in a new long-term housing strategy. During the next 10 years, $500 million will be spent to support new and enhanced affordable housing projects and programs in the province. A graduate home ownership program to encourage young people stay in their communities may also be implemented. Town Coun. Greg MacArthur was in Dartmouth on Monday when the announcement was made by Premier Darrell Dexter and Community Services Minister Denise Peterson-Rafuse. “Truro is very lucky. There’s a big need for it here … we want to make sure no one is without affordable housing and make sure people feel they are a part of society,” MacArthur told the Truro Daily News after informing town council about the good news on Monday afternoon. He said Halifax and Bridgewater were also taking part in the project, along with a few other Nova Scotia sites. Among the programs that Housing Nova Scotia is considering are down payment assistance, lease-to-own opportunities, the graduate home ownership program, and retrofit programs to help seniors and families caring for loved ones with disabilities stay in their homes longer. Locally, MacArthur said the former Alice Street Elementary School property could be the model used in this area. A public hearing will be held on June 10 at the next regular monthly town council meeting to discuss a potential agreement with Meech Holdings Ltd. to create a 28-unit development that could be incorporated in the new initiative. MacArthur said the project will assist people needing a more affordable home as well as dealing with landlords who neglect their property. “They could be given money for their property and it would be bought by a reputable landlord and move the tenant there,” MacArthur said. The councillor said the project is coming to fruition in part by the efforts of Truro Bible Hill MLA Lenore Zann. “We’ve worked for more than a year with Lenore on this,” MacArthur said. Zann said the initiative is great news, indeed. “I’m thrilled and excited and I’m really happy for the people of the province, because this is so needed,” she said, adding the effort is also a way to deal with homelessness. The housing strategy was built on themes that emerged from province-wide public consultations held last year with more than 500 Nova Scotians, including non-profit and community organizations engaged in housing issues, housing developers, governments, and residents. In addition, developers and municipalities will have the opportunity to work with the Atlantic Co-operative Council, Canada Co-operative Council or Habitat for Humanity. MacArthur said the next step locally is to meet with government department officials and make formal decisions about the Alice Street property. People in Nova Scotia who have filed domestic violence complaints would be able to get out of their residential leases early without penalty under proposed legislative changes introduced Monday. Service Nova Scotia Minister John MacDonell said the changes to the Residential Tenancies Act would allow people who say they’ve been abused to get out of fixed term or year-to-year leases with one month’s notice. “It allows them to move out of an abusive situation for their health and their family’s health and also relieves them of any financial liability that may exist with the lease,” said MacDonell. In order to get out of the lease, a tenant would have to make an application within 90 days of obtaining an emergency protection order and file a domestic violence complaint to police. They would need a peace bond or some other court order as well as a certificate from the province’s Director of Victims Services saying they are a victim of domestic violence. John Joyce-Robinson, a director of victims services at the Justice Department, said the changes are modelled on similar legislation in Manitoba. He said that legislation helped six to eight people in Manitoba in the first year it was enacted. The change was recommended in a 2009 government report on domestic violence. A proposed provincial property tax reform for landlords is coming under fire by people who rent and who want to see their bills reduced. But people who live in apartments, such as students, seniors and people on low incomes, may not see any rent reductions because landlords won’t be forced to pass on the savings to tenants. Andrew Martel, the president of the University of New Brunswick Student Union, said the provincial government should force landlords to pass on the savings to students. “The majority of those living here in Fredericton would feel safer knowing that these savings would come down to the students so that our rents wouldn’t be as high,” he said. Local Government Minister Bruce Fitch announced a series of property tax reform proposals on Wednesday. (CBC)Local Government Minister Bruce Fitch, who announced the proposed reforms on Wednesday, said he hopes the tax cut is passed on as lower rent, but stressed that’s not up to him. “We can affect the provincial tax rate on that particular building. We can’t directly pass that on to the renters,” Fitch said. Willy Scholten, who speaks for apartment owners in the province, said he wouldn’t guarantee the double tax being reduced by about one quarter will translate into lower rents. “The expectation would be this will have the ability to minimize rent increases,” he said. The local government minister said tenants push landlords to share the tax cut, just as landlords successfully pushed the provincial government to make the cut. The proposed package of reforms also includes a new “spike protection” mechanism to guard against large property tax assessment hikes, lifting the three-per-cent property tax freeze, and the option of monthly payments instead of one large annual payment.